Curtis Opera continued its season using the Prince Theater as their venue. That alliance took on particular resonance here, as the company ventured Sweeney Todd. The famous first production in 1979 was, of course, directed by Harold Prince, and surely represents one of his (and composer-lyricist Stephen Sondheim’s) crowning achievements. Prince’s spirit was visible here in some vestigial staging ideas that recalled his original, notably the baleful staring that breaks the fourth wall, a Brechtian notion beloved by the director, and one that effectively suggests Sweeney as a moral parable in which we, the audience, are implicated. I think Prince would also have been impressed, as I certainly was, with the exceptional orchestral playing, skillfully conducted by Geoffrey McDonald, which revealed diaphanous textures that I’ve not heard before in this score. The massed singing under chorus master Elizabeth Braden was, if anything, even stronger. Hearing the high soprano choral line in the opening “Ballad of Sweeney Todd,” was what I always hope it will be, but rarely hear done so satisfyingly. 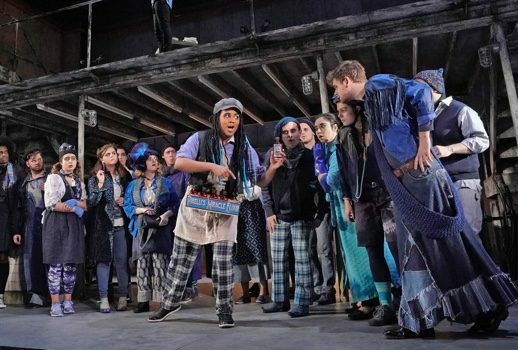 Ensemble coordination in Sweeney is a crucial value. It was this production’s greatest achievement, along with some fine individual vocal performances. Theatrically speaking, the show was on shakier ground. Sweeney can work its magic with different contextual frameworks. Prince’s original really went to town with the Victorian setting, emphasizing its politics as well as links to the music hall. John Doyle’s Broadway revival looked more like German Expressionism. Both were terrific in their different ways. Curtis’s staging had spare scenery (by Meredith Ries), suggesting a concrete bunker, effectively lit by Oona Curley—a good place to start. But director Emma Griffin introduced a hodgepodge of high-style concepts that never cohered. Striking moments often came at the cost of good storytelling—the disposal of the dead (I won’t say any more), for example, consistently drew attention away from what should have been the dramatic focus. 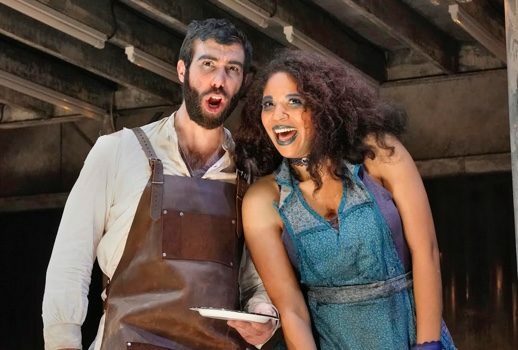 More problematic, the basic setting—the where, when, and why of Sweeney—was largely unaddressed. This was also the fastest-paced Sweeney I’ve ever seen. Perhaps trying for a sense of operatic structure, few pauses were observed, even within the dialogue scenes. Although this leant an energizing tension to the evening, it also meant that several key plot points failed to make much impact. Performances, too, were variable. Best was Amanda Lynn Bottoms as Mrs. Lovett, who sang the score more beautifully—and more lyrically—than I’ve ever heard it. Perhaps predictably, she was especially effective in passages (“By the Sea”) where her legit mezzo could be used; but she managed the parlando music hall style very well too, and her acting had a delightful sardonic tartness. With more experience, Bottoms will make more—and subtler—dramatic points, but this was a treasurable outing. Similarly, Lindsey Reynolds’s Beggar Woman was a vocal knockout. Sage DeAgro-Ruop brought silvery sweetness to Johanna’s music, as well as a touchingly vulnerable presence, though the conception here of the character is far too skittish and disturbed. In the male roles, Martin Luther Clark’s clarion tenor rang out effectively in Toby’s music. Dennis Chmelensky likewise sang well as Pirelli, and clearly relished the role’s hammy dramatic possibilities. Chmelensky was an audience favorite, but his Pirelli—and also the Beggar Woman—were treated here almost as star cameos, which compromises their dramatic purpose. Aaron Crouch (Anthony Hope) used his lovely, baritonal tenor to good effect in “Johanna,” but his rich timbre isn’t quite right for the ardently youthful character, whose music benefits from a lighter sound. In general, much of this score—with one foot planted in opera and the other firmly in American musical theater—lies too low for these operatic voices, calibrated for a higher tessitura. Often the lower vocal lines, and the dialogue, weren’t clear. Sweeney remains a big reach for any company—in fact, even in Prince’s legendary original, there were aspects I found unfulfilled. It’s ambitious and highly appropriate that Curtis would program it. If it wasn’t a home run, there were some fine individual contributions with promise for a significant future.